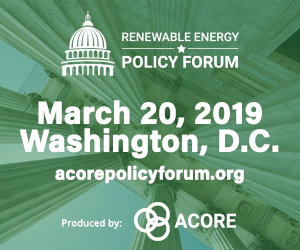 ACORE’s Renewable Energy Policy Forum (March 20, 2019 – Washington, D.C.) is the leading pan-technology renewable energy summit to address federal and state policy. With an agenda designed by industry leaders, the Policy Forum will examine key policies and market trends in the new Washington landscape, such as carbon pricing, infrastructure, and the evolving role of power markets. The Policy Forum unites industry leaders and key elected officials for engaging discussions that will examine the renewable energy landscape for the year ahead. Take advantage of early bird pricing. Reserve your spot today!